The New York Giants don’t have the luxury of spending a top draft selection on a wide receiver, so they will likely have to resort to a later round to bolster the unit. 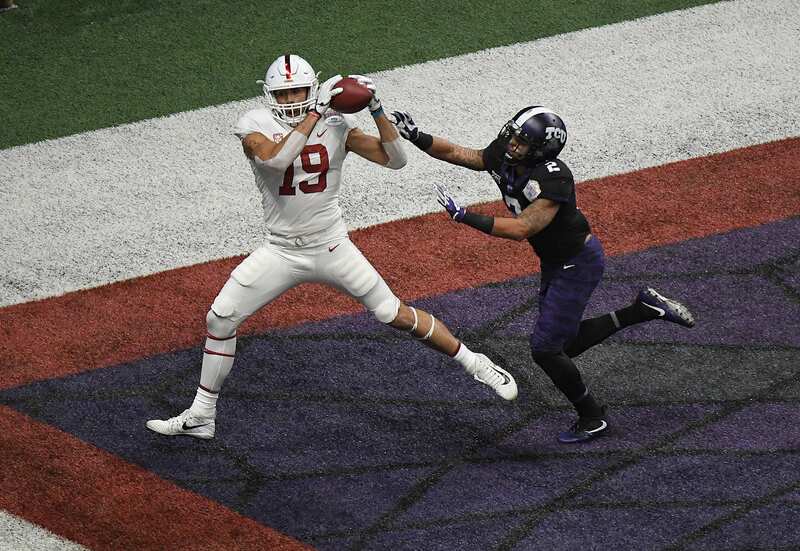 Stanford’s J.J. Arcega-Whiteside could fit the bill perfectly in a rather small Giants receiving corps. Arcega-Whiteside is a massive red zone target at 6’2″, 225 pounds, but lack of speed has hurt his draft stock in recent weeks. He did not compete in the NFL Combine, but his film proves he can be a great possession pass catcher on an NFL team along with his dominance on 50/50 balls. The Stanford product plays with immense strength and physicality, attacking the ball at its highest point and bringing it down with aggression to keep it away from opposing corners. He has initial quickness but lacks the ability to turn on the boosters and pull away from coverage. However, both of his parents gifted him with the ability to jump extremely high, thanks to their basketball skills. He excels at combat catches and back-shoulder/fade routes. He will likely be an NFL starter at the next level if he can manage to battle out smaller corners. Adding him to a Giants team that features Golden Tate and Sterling Shepard could be the perfect combination. Both Tate and Shep will theoretically attract the top coverage men on the opposing team, making Arcega-Whiteside that much more of a threat. In 2018, he racked up 63 catches for 1,059 yards and 14 touchdowns. This isn’t even a route, it’s JJ Arcega-Whiteside legitimately just posting up in the end zone. The strengths of Whiteside simply make route running obsolete. He obliterates the corner in the endzone by simply jumping over him with ease. Most receivers rely on their route running to get open in the endzone, but a guy as physical as J.J. just needs to grab the rebound. The bottom line, the Giants could theoretically snag him in the 3rd/4th round with any luck. He’s an impact player that would be dealt with liberally when facing opponents given the existing talent on the Giants’ roster.